The Ebonised Stool by Lola Lely features coloured stains in indigo, dark grey and black, in reference to denim workwear and the 'boro' indigo patchwork traditions of Japan. These stools are crafted from solid oak which has been stained and ebonised. This seating complements Lola's Maker's Trestle, and features a similar sharp and asymmetric aesthetic giving a distinctly modern edge. Material:Natural & ebonised oak. Brass peg & inlay detail. Lola Lely Studio is a multi-disciplinary studio founded by designer and RCA graduate Lola Lely. 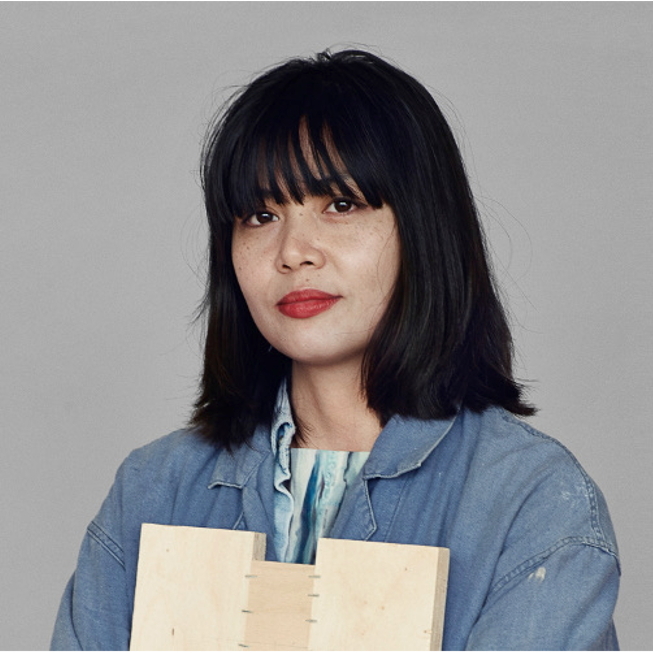 Lola was born in Hanoi but grew up in the UK, curious from an early age on how objects are made. Drawing, making and the connections between, material, process and maker are all central to her practice. Specialising in narrative driven installations and furniture, Lola brings an open spirit to her projects, collaborating with anthropologists, storytellers, chefs and silversmiths to produce her work.